I have got the travel bug. I mean, I have had the travel bug for a long, long time, but it is starting to itch. Just a tad. Ok, more than a little. A LOT! I want a real, honest-to-goodness, vacation. It is most likely a combination of waiting nine weeks after our arrival in China to take our first mini vacation and then the six-week waiting game for management to approve summer leave ahead of what was expected to be a historically busy visa season. Then after our wonderful but action-packed two week trip back to the US in May, it has been a waiting game again through the long, hot, busy Shanghai summer. At the same time it is because of this blog – going back to re-read my travel stories and journals – that I am also reflecting on past and future travels. In July 2000 I finished my three years teaching English in Japan and set off on a solo 11 month backpacking trip. I purchased an around the world ticket from Washington, DC to Finland, from where I would make my way overland to Tunisia, where I picked up the ticket again to travel to Egypt, then India, then Southeast Asia, and finally back to the US. It is not difficult to look back at that epic trip with something akin to a Pavlovian dog response – I am literally salivating as I think back to when I had some major time to really hit the road. At the time I was planning the trip, I had thought long and hard how to spend the $10,000 I had saved from teaching in Japan. I had come to the conclusion that banks would loan me money for graduate school but no one was going to loan me money to backpack around the world. I could spend my hard earned savings seeing the world and still be able to go to graduate school. So I deferred my graduate school for a year, bought the round the world ticket for half the savings, and set about buying travel guides and preparing for the rigors of travel by roaming my little Japanese town with weights in my backpack. I had no Kindle loaded up with reading material. I had no portable music. I certainly had no cell phone. Internet on the road was still fairly new with Internet cafes popping up in more and more places but in some costing quite the pretty penny (in Venice I recall it costing $25 an hour, which was more than I averaged in total spending per day for everything. I mean lodging, food, sightseeing, and toilet charges. One could not forget to budget for the public toilet). That is not to say that my trip sans e-books and iPods and smart phones was any better than anyone else’s backpacking trip. Lord knows that those who hit the road 10 or 20 or more years before me had done with less than I had. Fewer guidebooks, fewer made-just-for-the-backpacker-bags, fewer hostels, fewer goodies from home in unexpected places. I read a post online the other day where someone outright dismissed the write-up of a young man just returned from his seven month backpacking journey. Geez, people, everyone deserves to travel the way they want and their journey is no less valid than yours. If they want to do it on an eight day, five country bus tour, then so be it. Just be glad that someone is out there seeing the world, stepping out of their comfort zone (and yes, a crazy guided bus tour with 20 other couples CAN be out of one’s comfort zone) and experiencing another country and culture. Instead of an e-reader I lugged around five actual books in my pack and when possible I traded it for another book after I finished. It was in this way that I got a hold of my first Harry Potter book, from a British girl in a hostel in the Czech Republic. I also took the one and only English book from the hostel in Vilnius (a ridiculous romance novel that made a Harlequin seem like Shakespeare. However, the loss of a book, such as when I left behind a half finished book in my Tunis hotel, was felt keenly. (I still wonder how that book ended). I also carried around four blank journals, which I slowly filled over the course of my trip. So I read and I wrote in my journal. I wrote a lot of postcards (do people still do that anymore?). I rode a lot of trains and buses and I looked out of a lot of train and bus windows at the scenery. I took a lot of lovely naps on long trips. I met a lot of people and saw some incredible places. I got sick. I got angry. I got tired. But mostly I was amazed. When I started I had no idea how long I would go. I thought perhaps five, maybe six months. I planned only in general. Itineraries changed. Destinations changed. I never made a hotel reservation. Sure, I still had limitations, but I was also quite incredibly free. From my few emails along the way (saved by my aunt) and my journals, I have attempted to re-trace and share some of my journey. It has been fun and enlightening, and sometimes even cringe-worthy, to go through my journal entries. I find it odd what topics found their way into the journals and other things I still remember but neglected to write about. My family and friends do not really know the story of this journey, only bits and pieces. It was an incredible journey that I would never ever give back. It shaped me. I learned my weaknesses and my strengths. It taught me what I could do on my own and further fueled my zest for travel. I am not sure I will ever have another trip like this. First of all, it is a pain in the rear to explain to every security clearance investigator about this “gap” in my work and education timeline. The first investigator just could not grasp the concept at all. When I tried to explain that I did not recall the places where I stayed as I just turned up and found a place and moved on a day or two or three later. He told me he was going to write I was “in the woods” for five months in Europe, which I explained did not think would be helpful in my bid for a government job. Second, I will also not again be my twenty-something self, with graduate school and an unknown career ahead of me. I will not be the person I was before I had my daughter. I do not want to be. Yet I am grateful now to be revisiting this part of me. I have absolutely never regretted spending my savings on this trip and borrowing for graduate school. I am fairly sure I would have been told it was a bad idea. Good thing I never asked anyone. After I had put up my previous post, an essay written for the Associates of the American Foreign Service Worldwide (AAFSW) upcoming book on “Raising Children in the Foreign Service,” I thought more about what it means to be a single parent in the US Foreign Service. I realized I had more I wanted to share and reflect on regarding this topic. I recently celebrated my four year Foreign Service anniversary. When I joined the State Department I was eleven weeks pregnant, so my daughter has been part of my Foreign Service experience from the beginning. She and this job are forever intertwined, like fraternal twins. It was because I was pregnant that I bid on Ciudad Juarez, Mexico—where I could easily bring a car and drive over the border for baby formula and diapers at Target—rather than bidding on the places like Kathmandu, Nepal or Rangoon, Burma, that quickly caught my fancy until I remembered that I was no longer bidding for one. In the past I had not really thought of myself as a Single Parent in the Foreign Service. I was a single parent AND I was in the Foreign Service. When people, usually colleagues, asked how I managed I often shrugged and gave some answer like “I have always been a single parent, so I do not know how to be otherwise.” That is true, but now I feel the response is too flippant – it plays down the challenges that myself and other single parents face in this career. Writing the AAFSW article made me realize I have had far more “Single Parent in the FS related episodes” than I had previous thought and more are to come. It was me who sat in the Basic Consular Course and heard the instructor use the word that starts with “b” and rhymes with “mastered.” Though it was meant to be a light hearted comment on a law that appeared to favor single American mothers over single American fathers, it could have been quite hurtful. I did not know then how much it might still resonate with me now and I am glad I made the effort to speak with the instructor. Yet before I even made it to the Consular course, early in my Spanish studies, I had an experience that still makes me go “hmmm.” Given the Ciudad Juarez is a danger-pay post and one in which a lot of new officers bid low but are assigned anyway, Mission Mexico made an effort to reach out those newly assigned officers early. As I knew I would be a single parent once arriving at post my number one concern was child care. Unless they were going to let me papoose my infant to my back and conduct visa interviews that way, I was going to need a full time nanny, and quickly. I reached out to the Community Liaison Officer (CLO), a person a post that fulfills a lot of roles but one is helping officers with issues such as this. My email was short, but detailed, indicating I was a soon-to-be single mother and I could use some assistance with sorting out child care at post. The CLO responded with a spreadsheet of housekeepers that could do part time babysitting. In both cases things worked out, as they generally do. And in neither case did the CLO intend to do anything other than help, even if it was not actually helpful. Again, the originator of the message meant no ill-will and in fact several people pointed out that the initial message implored people to help out their married colleagues and yet not all married couples have children. The writer owned up right away, apologized for any offense and sent out an updated and all-inclusive email. In speaking with the person later, s/he told me that actually the email had been cleared by four other AEA members before being sent out and none had caught the mistake. It was these experiences that prompted me to include in my essay’s practical thoughts/advice list a gentle reminder that in many cases people are well-meaning but just unfamiliar with what it is like to be a single parent. I certainly need to remind myself of that and give people the benefit of the doubt. I blinked. I was speechless. I have had people upset and apologize for making the assumption, but no one before had appeared quite so horrified at the prospect of my having a child without a husband. I have no idea what her assumption may have been – that I was divorced, widowed, or otherwise. I will never know (unless of course I contacted her from her card, which I have no intention of doing). This did lead me to do some thinking. When I wrote my essay I was thinking about US stereotypes of single parents, not those we might face in other countries. Yet as Foreign Service Officers we have to face them in both realms. It was not that long ago that women after marriage were strongly encouraged to leave the US diplomatic service. (read here) Of course single moms are by nature generally not married, yet I doubt such women were any more welcome, and most likely less so. Yet it was the response of the AmCham woman that prompted me to look into how single mothers are treated in China, and what I found was unpleasant. Though it would seem that attitudes may be changing, the Chinese marriage and birth registration system and traditional values still create an environment where single mothers are shunned and subjected to social stigma and their children are treated as second class citizens. (see here) Given these government and societal attitudes it is highly unlikely that the Chinese government or Diplomatic Corps includes any single mothers. Yet China is not alone in its approach toward single mothers. Google “single mothers in _______” and finish it with Korea, Japan, UAE, India, Jamaica, etc, and you find articles that indicate that there remain social constraints and stereotypes amidst a rise in numbers. Another member of my Single Parent in the FS group shared with me that when she lived in Israel a woman once snarled “no wonder your husband left you” when she asked for five more minutes for her daughters to play in the shared garden. This forced me to realize that there may be times when my statement that I am a single mother may be met not with embarrassment or pity but even with hostility. I am not sure what I will do then, but I am trying to be prepared now. I want to do more in this area in the future; my current job as visa interviewer extraordinaire however does not give me much time or opportunity to work on other things. Until then I just want to continue to be a good Foreign Service Officer and mother and hope that by doing so, and sharing my status with others, it makes a difference somehow. In May while I was on leave an organizer of the new Associates of the American Foreign Service Worldwide (AAFSW) book on “Raising Kids in the Foreign Service” contacted me to ask if I would be open to writing a chapter / essay from the single parent perspective. I was thrilled to be selected though in truth, the organizer admitted, I was the only single parent in the FS she knew. No matter, I was excited about the prospect of writing such an article; in January I had, with another FS single mom, just launched a Facebook page for single parents in the FS and this was another opportunity to get the word out that there are single parent diplomats. With the organizer’s blessing I am sharing most of my article here. It was written in conjunction with feedback from members of our new Facebook group. Situation? The Single Parent situation? You would have thought she had asked how to import a unicorn. That’s us, the single parents, the unicorns of the Foreign Service. I am not going to lie: being a single parent in the Foreign Service is no cake walk. But that is not news, right? Because just being in the Foreign Service is a challenge and so is being a single parent. Put them together and you have yourself a recipe for some demanding but exciting times. The PCS. We hear the laments of our single Foreign Service Officer brethren; it sure is hard to manage a pack out all by yourself. Then throw in a wee one or two and, if you have truly lost your mind, a pet. Nothing says fun like managing your suitcases, carry-ons, a stroller, a child, and a pet on a two leg 24-hour international journey all by yourself. It is extra fun when, as one single parent recently shared with me, your elementary-school aged child breaks his arm ten days before. Because as they grow older you kinda expect them to pitch in, right? Setting up child care/school. We hear you tandem parents. Needing to take off work immediately after arriving at post in order to interview and hire a nanny or register your child for school might call for some of those diplomatic skills. After all, post wanted you yesterday. This is especially the case of the single parent, because, well, the person taking off work is you or you. Most places seem to frown upon children registering themselves. And it doesn’t just stop with enrolling them in school. There are teacher-parent meetings, special events, times when you need to head in to the school and again it is you, the single parent, that needs to take the time to take care of it. And you hope that your supervisor and colleagues understand. We face many of the same challenges that single/working parents in the US face, with the additional challenge of being far from familial and other support systems. The “helpful” colleague/supervisor. It is super awesome when co-workers or supervisors decide that you really can have it all and that of course you would love some more time away from the kids. After all you joined the Foreign Service! For instance your post has some opportunities for some 2-4 week TDYs. You are interested but cannot realistically work out the child care (you would after all have to buy the plane ticket for your child and the nanny). That is ok, says your colleague, just leave your child behind with the nanny. Problem solved! Except your child is under five. Or when facing the very real possibility of a post evacuation (that did not in the end materialize) your supervisor suggests you ship your children to someone so that you can concentrate on your job. Or the opposite is the overly accommodating supervisor who, as one single parent mentioned, bend so far over backwards to be understanding that you miss opportunities, like TDY assignments. Stereotypes. Single parents are divorced. Single parents have contentious relationships with the other parent. Single parents are female. Single parents are unlikely to be in the Foreign Service. And these categorizations extend to our children – our kids have discipline problems and trouble adjusting. It is all over the Internet, so it must be true! I do not often think on these stereotypes, after all, I have never been married, have a good relationship with my daughter’s father, and we are, in general, rocking the FS life. We come to be single parents in so many ways, sometimes through divorce or separation, sometimes due to the death of a spouse, sometimes by choice, by natural birth or adoption. So when these stereotypes come to the fore it can be surprising and upsetting. We may face uncomfortable questions. We sometimes feel excluded – we are not the singles without kids, we are not the married without kids, we are not the married with kids. And worst of all, our children might be teased or bullied. At this very moment, as I am trying to piecemeal the final draft of this essay, I am serving as duty officer and the duty phone has been ringing off the hook. A colleague contacted me and asked if she could take my daughter for a few hours to give me some time to handle the duty calls. She even brought me food! We all are grateful to such colleagues who understand the demands of the FS and are willing to lend a hand when we need it. Teachable Moments. Although approximately thirty percent of US children grow up in single parent households, single parent families are underrepresented in the FS. Like any member of the Foreign Service, we are the face of the US while serving overseas. We may not always want to be the representative of a group, and this may seem an odd thing to consider a benefit, but this is an opportunity to show people in our host country, and sometimes even our colleagues, that single parents are more than stereotypes. When in the Basic Consular Course at FSI we study about citizenship. In general an unmarried citizen mother with a non-citizen father has fewer requirements to transmit citizenship. During my course, the instructor made a joke about unmarried mothers and their offspring using a word that starts with “b” and rhymes with “mastered.” At the time my daughter was five months old and it had not yet occurred to me this word would ever be used to describe her. I did not know how I felt about it. So afterwards I approached the instructor and let him know I was a single mother and he may want to consider his audience. The instructor immediately apologized, said the context had not occurred to him, and that from thereon forward he would not use that joke. Other Benefits. Many single parents reported to me that the material and cultural benefits are a major advantage, and a reason why they stay in for the long haul. The free housing and generous educational allowances that allow our children to attend some pretty amazing international and/or boarding schools are significant. Add in the month-long R&Rs and home leave, and children of separated parent travel, and the very un-American four weeks of vacation, and the perks of the FS shine through. In a survey of FS single parents to sum up their experience in the FS lifestyle, I initially received nothing. Zero. Nada. Seriously, single parents in the Foreign Service have no time to answer informal surveys! We may require a little bit of lead time to make child care arrangements, but once done, we dedicate ourselves to our jobs like any other officer. We are Foreign Service Officers. Not that we don’t sometimes second guess ourselves or some days find ourselves exhausted by the challenges. Not that we do not sometimes wonder why in the world we are doing this, dragging our kid(s) around the world away from our home country and family. But overall the benefits outweigh the challenges. You can not only survive in the Foreign Service but thrive and so will your kids. Single parents are represented in every level of the Foreign Service from the entry level officer to Ambassadors. We are specialists and generalists and in all of the Foreign Affairs Agencies: State Department, USAID, Foreign Commercial Services, and the Foreign Agricultural Services. Oh, and our kids? Our kids are awesome. • Accept help (even if you have to pay for it). When traveling, instead of torturing yourself by lugging all your suitcases and kids on your own, pay the money for the luggage cart or porter service. There are even door-to-door delivery services! Believe you me, staged movement of the luggage and child at 50 foot visible intervals across the airport is no decent way to travel. Not that I have ever done that. You will be amazed at the kindness of others. Children are cherished in almost every country around the world and in my experience people will step in and help. In China not only do people hold my daughter’s hand on the escalator, lift her on or off transportation, or open doors for me with the stroller, but they are giddy with excitement for having helped. And those at post who offer to watch your child/children? Take advantage! I found myself reluctant to accept, after all, surely they were offering in jest to spend hours with a child completely unrelated to them. But look, if they did not want to help they would not have offered to help, right? Also, be sure to reciprocate – host their kids for a play date, take care of their pets while they are on vacation, buy them lunch, etc. • Be realistic with yourself and upfront with post/ supervisor. You are not Super Single Parent, even if it sometimes feels that way. No need to volunteer for every extra job under the sun to prove yourself-your colleagues are generally not doing this, why should you? Have a straightforward conversation with your supervisor about your situation and what you can and cannot do. Manage expectations. And if circumstances change – you can take on more or you need to step back a little – have that conversation again. • Have a plan. An emergency could be an authorized or ordered departure, or a medical emergency that leaves you indisposed, or should something happen to your child while you are on TDY, etc. Designate a family member in the US, create a power of attorney for one or two Americans at post, and when your child is old enough, talk to them about the plan and what to do in an emergency. Yes, Mission China is a study in visa superlatives. And working here, at least in my mind, is sometimes like a movie, perhaps a cross between Mission Impossible and Office Space. The visa numbers for China are astounding. H1-B visas, for temporary workers in specialty occupations, are limited each year to 65,000 worldwide (with a few categories that have exceptions to the quota). According to a United States Citizenship and Immigration Services (USCIS) 2013 study, Chinese represented 8 percent of H1-B visa beneficiaries, the second largest group after India. F-1 visas are for full-time students. Institute of International Education (IIE) data indicates Chinese students now make up nearly a third of all international students at US universities. The Chinese also appear to very much like US private secondary schools; they make up 46% of international students pursuing high school diplomas. And Chinese tourists? Approximately a quarter of all US B1/B2 (tourist) visas issued worldwide go to Chinese! This year alone Mission China (all our Consular units in Beijing, Shenyang, Shanghai, Chengdu, and Guangzhou) is expected to issue some 2.3 million visas. The average Chinese tourist spends US$6000 while visiting the States. That translates to tens of billions of dollars a year. And right now these Chinese tourists to the US represent only about two percent of Chinese travelers. Mind. Blown. Right? Shanghai is the second largest non-immigrant visa (NIV) post in the world (blowing my previous post of Ciudad Juarez, ranked about number 15 for NIVs, out of the water) . We are in the top 10 of H1-B posts and a major post for student visas. Since last November when the US and China announced an agreement to extend tourist visa validity from one to ten years, Chinese applications for US visas has been on the rise. Basically since my arrival in Shanghai, we have seen record breaking numbers every month. In March we hit an all-time high, adjudicating more than 5,600 visas in a single day. In April we printed a record-breaking one day total of 7,000+ visas. Yet in June, after the worldwide consular systems issue resulted in our being unable to print tens of thousands of visas, our incredible print team remained late one night immediately after systems were restored to print over 13,000 visas in a single day. June is our busiest month. It is when our normal 50 student applicants a day (the average in March 2015) reach over 800 a day. In total, Consulate Shanghai adjudicated almost 87,000 visas in June 2015. 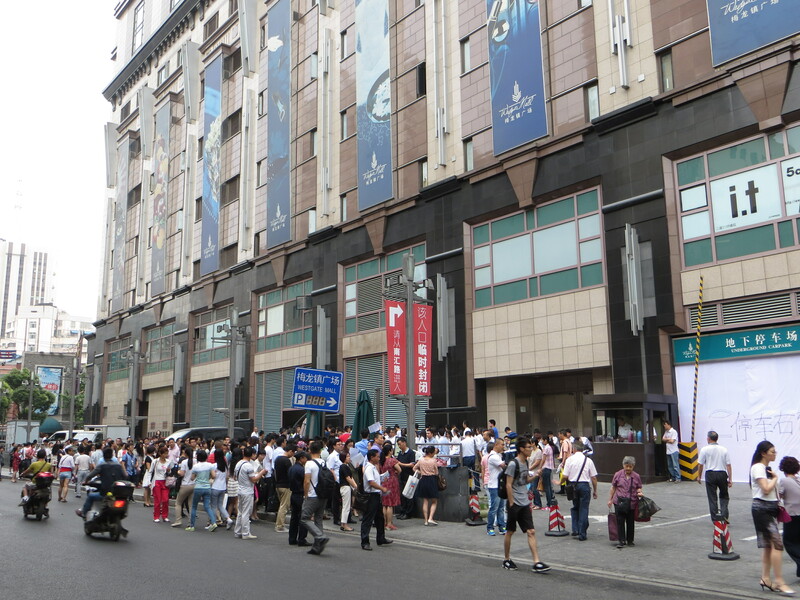 Early morning Shanghai, visa applicants begin to line up outside Westgate Mall. What in the world is it like to work here? Most days we aim for approximately 4300 interview appointments. That is more applicants than some posts see in an entire year! Each visa officer is expected to interview a minimum of 120 applicants a day, though most of us, once “on the line” for more than a few months exceed this amount. I arrived in Shanghai in late January 2015 and due to my training schedule and the Chinese lunar New Year, which occurred just three weeks after my arrival, my first interview day was not until February 26. Yet from that time through June 30, I adjudicated over 9,000 visas. In June my month tally was 2,667. And to think I am one of the slower adjudicators. I will be honest here, it isn’t easy. Interviewing that number of people every day is mentally and physically draining. It is not tiring in the same way as I found the Immigrant Visas in Ciudad Juarez. The complexity of the cases, the amount of paperwork, and the stakes for the applicant (to become a new US citizen or not) are generally higher in IV work. There were cases that kept me up at night and many that made me weep from joy or sorrow. There are cases from Juarez I doubt I shall ever forget. It is the repetitiveness of NIV and the sheer number of cases per day in a post like Shanghai that wear on the visa officer. Still, I will not say I do not like the job. There are days that are fun and interesting; there are applicants that bring a smile to my face and even a few that cause me to choke back tears (generally happy ones). I am astounded by the number of Chinese students who want to pursue their educational dreams half way around the world. At 18, I was pleased as punch to be going to an out-of-state school in Georgia, some 650 miles away from my Virginia home. And although I did do a study abroad in Beijing my fourth year, I am not sure I would have ever been ready at that age to spend four years studying so very far from home. I have had the pleasure (and sometimes pain) of interviewing easily over 1,000 Chinese preparing to go to the US for their BA, MA or PhDs. It can be mind-numbing to hear yet again that the reason for his/her interest in studying in the US is “because the US educational system is the best in the world” or “this school is ranked X in the US in my degree program” or “the teaching level of this school is optimal for my career goals,” which, as genuinely as the applicant may believe these statements, simply sound like well-practiced platitudes. It is far more interesting to hear an authentic declaration such as the student’s hope that they will find either llamas (California) or alligators (Florida) on their university grounds or their fervent fascination with the number of hectares the campus of their college occupies. Although these do not sound like particularly relevant reasons to choose to study at one school over another, they are a welcome change. Of course the best answers are the sincere and honest ones, in which the student’s eyes shine in anticipation and hope that you will grant them the visa and make the first part of their dream come true. I am even more astonished at the number of students prepared to attend our private secondary schools. There is of course many a US family (many Foreign Service Officers among them) who choose to send their children to private boarding schools far from home. Yet, I am not of that world and my daughter is so young, I have a hard time imagining sending my 14 year old child 10,000 miles away for high school. These children often arrive at their visa interview alone, on their own to present their case for study in America. Many are shy and stumble over their words. Others appear incredibly mature and confident. Faced with one such young female student I was impressed when she answered my question about being concerned to study in the US alone with “No, I welcome the adventure and the challenge.” Her tone told me she no doubt did. I see relationships on display every day in the interview line. In a culture where public displays of affection are still infrequent, it is nice to see a father familiarly hang his arms across the shoulder of his wife and teenage son and grin or long-time friends give other a joyful slap on the back when they know they get to take their 18 day USA group tour together. While I may not be too sure of the idea of a two week group tour with my parents, here I have interviewed many adult children traveling with their parents, grandparents with their grandchildren, married siblings with their spouses, married couples with both sets of in-laws, even the occasional ex-husband and ex-wife traveling with their child. I am amused and intrigued by the number of newlyweds who wish to honeymoon with a group of friends-maybe it is actually a nicer way to celebrate? Sure, as a visa officer at a busy post I only get a few minutes at most with each applicant and I cannot lie that there are days when I see this as monotony stretching for the next 22 months. But other days, I see, and feel, the amazing opportunity to both serve my country and interact with a heck of a lot of Chinese, who just want a chance to visit the US. Some days it is pretty incredible in Visaland. So the big news is that I have extended here in Shanghai. Or rather, my request to extend has been approved, because nothing like that happens without getting approval from DC. Why in the world would I want to do even MORE visas? Especially when colleagues around me are applying for onward assignments that allow them to curtail. Many of the younger and/or single folks heading on to third tours opted to bid on and accept handshakes for positions in one-year unaccompanied posts, or the Priority Staffing Posts (PSP) like Afghanistan, Iraq, Libya, Pakistan, South Sudan, and Yemen. Of course married folks too opt for these posts. But me, the single mom of a toddler? No. No, I extend. I requested the extension so that I might move from the winter bidding cycle on to the summer cycle, because A. there are more bidding options on the summer cycle and B. because soon enough school will become an issue for us and it would be nice not to have to pull my daughter out in the middle of a school year (though summer cycle does not guarantee that – nothing in the Foreign Service is ever really 100% a sure thing). It helped my case that Chinese is a super hard language that generally takes 36 to 44 weeks at the Foreign Service Institute to reach the required level and China is experiencing a huge boost in visa applications and we are short staffed to meet demand (though making a super valiant effort anyway). Here I was, already in China, with the requisite Chinese level, asking to stay longer. So it was granted. A three month extension brings my tour to April 2017, which makes me eligible for the summer cycle. Bidding. It is bidding season now, though not mine, but there is that whiff of excitement and anxiety in the air. Colleagues who are in the midst of the cycle huddle together, whispering about “handshakes” and jobs “slipping off the list” and follow-up phone calls and emails, about interviews and “lobbying packets.” There is a whole vernacular devoted to mid-level bidding. I will not start until next summer, yet it has not stopped me from already daydreaming about the possibilities. Alright, truth be told, I am doing far more than dreaming. I am researching potential posts. I am thinking through the ramifications of another stint at language learning at the Foreign Service Institute (something I swore up and down that I would NOT do before my third tour). I am imagining us in Post X in Central America or Post Y in Africa or Post Z in Asia. Do I want myself and my daughter to take anti-malarials the whole tour? Would friends and family visit? How difficult is it to import pets? Is the tour straight up Political or is it a Pol-Econ or jack of all trades? Is it an Embassy or Consulate, large post or small? How are the schools? Each and every one with positives and negatives to ponder. However, although it is fun to research and ruminate over the options of where we might find ourselves living next, it is also a bit odd to already be thinking about the follow-on post. I liken it to running for the House of Representatives. No sooner have you been voted in when you begin to prepare and campaign for the next election. Every month a farmer’s market of sorts is held in the atrium of the apartment complex where I live. There one can find fruits and vegetables from organic farms but also homemade chocolates and baked goods and other products. Many of the sellers are foreigners who have lived in Shanghai for awhile, they have set up businesses. Last month I stopped at a table where a woman, about my age, was selling specialty soaps and home tonics. I ended up talking with her for about 30 minutes and found out that it is a company she founded and operates with her husband – an Australian/New Zealand couple with seven and fourteen years living in Shanghai respectively. I have spent the past few weeks thinking on that. My three month extension means that we still have approximately 22 months left here in Shanghai. [“Approximately” because an ETD is still always rather fluid as one could leave April 1 or April 30 or even March 1 or May 31 and still be within the general departure guidelines.] But Foreign Service Officers are generally less permanent and more nomadic than many other expatriates. We arrive in country knowing we are here for only a certain period of time. Sometimes you will hear us say such things as “I can live anywhere for two years.” So even if we have to put up with a less than ideal assignment, with less than ideal housing, with less than ideal local conditions, we know it is temporary. And as a result I feel quite eager to see and do as much as I can in and around Shanghai before we move on to the next tour, wherever that may be. Yet there is just WAY too much to do in Shanghai. As I noted in my post the 5 Pros and Cons on Being Posted to Shanghai there are some 70 museums alone in the city and they keep opening them faster than you can visit. In the last few years alone several world class museums have opened. Add in the restaurants and special events (Cavalia, a sort of Cirque du Soleil with horses, is coming this month as is Linkin Park in concert) and the cultural and historical sights like the Bund, Yu Gardens, the temples, the French Concession… Next year brings the opening of both Shanghai Disneyland and Shanghai Legoland Discovery Center. What’s a history/museum/travel-loving mom to do? Reading a “Real Post Report” for one small southern African post I am considering bidding for my next tour the author wrote that the biggest quandary on a Sunday would be whether to go to one hotel for brunch or another hotel to swim. I wonder how I would deal with that. Part of me thinks it sound wonderfully simple and another part of me worries I would be bored. Would I feel more like an expat and less like a long-term tourist? For the time being it is a moot point. We still have time here. My biggest dilemmas are often should I rest after that exhausting week of visa interviews or should I pound the pavement and ride the metro to yet another incredible sight?